Bonfire night in Britain is perhaps the closest thing to a national holiday, even though it isn’t one. Every November 5 the night skies around the country are filled with flames from giant bonfires and fireworks displays as the failed bombing of parliament in 1605 by Catholic conspirators is remembered. 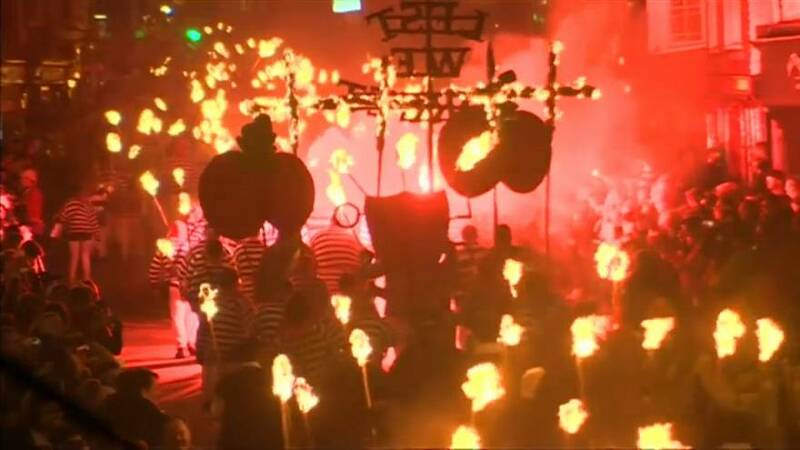 Lewes in Sussex has long had one of the most controversial bonfire nights, joyfully burning the Pope in effigy and assorted villans of the day, and Harvey Weinstein made the rogues’ gallery this year alongside gunpowder plotter Guy Fawkes and the other usual clerical suspects. As kids in the slums of Bradford we’d scavenge for factory pulley rope soaked in oil & on #BonfireNight we light & spin it in the dark air. BBC mini-series “Gunpowder” starring Game of Thrones’ Kit Harington, himself related to one of the plotters, has just ended, telling the story in a timely way, but it is a story all schoolchildren know more or less, and come out every 5th of November to enjoy, along with their families and roasted chestnuts. Thousands of people visit A&E every year with fireworks-related injuries.